The Business Intelligence (BI) Platform Capability Matrix sets the technical details of the BI Platform Capabilities and also valuates the leading BI platform products based on the technical capabilities. The matrix serves as a high-level guide to understand the technical capabilities of each vendor’s shipping products. Beyond the vendor selection, the capability matrix should basically be used as an architectural guide to what should be included in a comprehensive and well-balanced BI platform. Organizations should decide the capabilities that are required based on the requirements. · While the core functionality of the offerings such as reporting, ad hoc query and Online Analytical Processing (OLAP) in the market is reaching similarity, there exists some major differences in each vendor’s strategy in optimizing the query performance. There are three dominant approaches, the conventional pre-calculated Multidimensional OLAP (MOLAP) architecture which loads detailed data into memory, and optimizes the relational queries with the aggregate tables, and also caches and multipasses Structured Query Language (SQL). · Vendors who have built their technology have better integrated infrastructure than those who have grown through acquisition. However, most of the vendors have done a reasonably good job of integrating dissimilar products by leveraging the same security and metadata infrastructure. · Scorecards are difficult to differentiate. Most of the vendors with a scorecard product are able to meet all the requirements requested where the technology is the easy part. The difficult part of deploying a scorecard is defining the key performance indicators, aligning the metrics and then applying it to a performance management methodology. 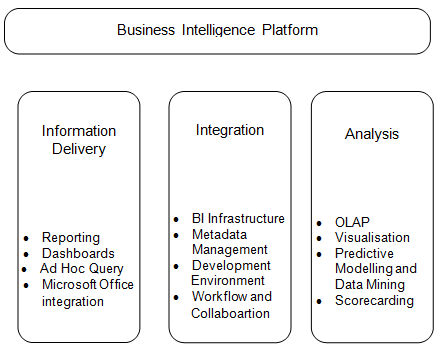 There are 12 capabilities in BI platform and can be divided into integration, information delivery and analysis. Figure shows the BI platform capabilities. Presently, in BI platform more concentration is on information delivery but the analysis and integration which are the two categories also play an important role in BI deployments. Organizations must boost their analysis capabilities to discover new insights which will lead to competitive differentiation and performance improvement. The BI platforms should improve their analysis capabilities to find out new insights that can lead to competitive differentiation and performance improvement. It should also improve its integration capabilities to put together the analytical insights back into the business at both the strategic and process level. The Information delivery capabilities will always be required to inform the stakeholders to allow them to constantly monitor the performance of the business and also take corrective action when the actual values are different from the projected goals. Only the combination of all the three capability categories (integration, information delivery and analysis) can build a platform which can deliver BI pervasively to the business. There are four BI platform capabilities in the information delivery category which are reports, dashboards, ad hoc query and Microsoft Office Integration. User organizations are investing heavily in all of these four capabilities which are pulling many vendors including the nontraditional BI vendors into the space. The relative similarity across most of the vendors’ information delivery offerings will force most of the organizations to validate the vendor spend in this area. More costly BI platform vendors will have to distinguish themselves in the analysis and the integration categories to maintain the higher prices. a. Reports: This capability allows the creation of formatted and interactive reports with extremely scalable distribution and scheduling capabilities. Interactive reporting allows the users to create, display and save the prompts that will filter the data and the layout of the report. The BI platform vendors should also handle a broad array of reporting styles for example, financial, operational or performance dashboards with data from both the operational and the analytical sources. The reports should allow the cascading parameters. For example, when a user drills down from an annual sales report to a monthly view, this monthly view has to be maintained while going to another report. Finally, this capability should help in easy to search and also navigate the information in the report, as well as the repository of reports. b. Dashboards: This capability is a subset of reports which consists of the ability to publish key performance metrics to a Web-based interface with the display of information, which includes dials, gauges and traffic lights. Dashboards should give a positive or negative trend indicator and a colour-coded summary which shows the state of each metric compared to an established aim or threshold. The end users should be able to create their own performance metrics. Real-time update of the dashboards to reflect the events or the scheduled updates to the metrics is vital for the BI applications to focus on the operational tasks. Finally, the dashboards should allow the difficult alerts and notifications based not just on one metric but on groups of related metrics. c. Ad Hoc Query: This capability allows the end users to build their own reports by asking for ad hoc queries. A business-friendly semantic layer which hides the difficulty of the underlying data sources is a main ingredient. Conventionally, the ad hoc query capability has been limited to just the data warehouse but, increasingly, ad hoc queries will be aimed at a broader set of sources. Performance is a main issue for the users performing ad hoc queries. Hence, the BI platforms that give this capability should fulfill many requirements to improve the query performance which includes aggregate awareness, caching, multi-pass SQL, query governance, performance auditing and native SQL commands. Another issue is the capability to harness the ad hoc queries created by the end users so that they can be easily turned into standard reports and publishing systems. d. Microsoft Office Integration: In many deployments, the BI platform is used at the middle tier to manage, secure and also execute the BI tasks; while the Microsoft Office, particularly Excel, will act as the BI client. At a minimum, the BI platforms must be able to give the reports in the Excel while keeping the report format and allowing the Excel users to easily refresh the data. Increasingly, the BI platforms are able to deploy all the conventional functionality such as parameterized reporting, dashboards, scorecards and OLAP in an Excel client. Some of the BI platforms extend the functionality beyond the Excel to include other Office applications, such as the Word and the PowerPoint. The advanced functionality includes the ability to author new reports in Microsoft Office which can be saved back to the middle tier BI server, and the ability to centrally control and secure the BI documents in Office. There are four BI platform capabilities in the integration category. They are infrastructure, metadata, development, and workflow and collaboration. Of all the BI platform capability categories, this is the least mature. Most of the BI platform vendors do a reasonable job of giving an integrated infrastructure, including the security, metadata and administration tools, but some vendors with an aggressive acquisition strategy will find it difficult to maintain. Most of the BI metadata is used as a semantic layer for self-service reporting. BI metadata must play a bigger role in standardizing the dimensions, hierarchies, measures and performance metrics across the organization. However, the BI metadata must talk to more applications than just that same vendor’s reporting tools. The development environment must go beyond the programmatic Software Development Kits (SDKs) to include more visual development functionality and more dependence on Web services. Finally, as the BI becomes more process driven, the BI platforms will require better integration with workflow and collaboration offerings. a. Infrastructure: To assess this category, each BI platform has to be integrated, including the common security, metadata, administration, portal integration, object model, query engine and also shared look- and-feel. The real litmus test for the tightly integrated infrastructure is the capability to deploy all the BI functionality with a single installation. Analysts have examined other infrastructure attributes, including the support for workload balance, zero footprint clients, 64- bit computing, Ajax, Unicode along with the ability to run on multiple operating systems or databases. b. Metadata: Strong metadata is the vital capability of a BI platform. Not only should all the tools leverage the same metadata, but the offering should also give a strong way to capture, store, re use and publish the metadata objects. To assess a BI platform’s capability in this area, analysts look for a single repository for different types of BI metadata, which includes the dimensions, hierarchies, measures, performance metrics and report design objects. The BI platform vendors were asked if multiple and simplified views of the metadata based on subject area domain could be supported. The data lineage and the impact analysis were also vital requirements. The BI platforms were also assessed on a range of other features, including: the ability to understand the metadata; search ability and openness of the metadata along with the ability to promote and reuse the metadata across various users, developers and application types. c. Development: The BI platform should give a set of programmatic development tools, along with a Software Developer’s Kit, to build the BI applications and also integrate them into a business process and put them in another application. In addition, the BI platform should allow the developers to build the BI applications without coding by using wizards and drag-and-drop tools for a graphical assembly process. The development environment should also support the Web services to do common tasks such as scheduling, delivery, administration and management. d. Workflow and Collaboration: This capability allow the BI users to both share and discuss the information through the public folders or the discussion threads, and also integrate the BI results within the context of a particular business process. With the help of this capability, the BI application can assign and track events or tasks given to particular users. Often, this capability is provided by integration with a separate portal or workflow tool. The analysts evaluate each BI platform’s ability to activate a task-specific to the workflow based on the outcome of the BI-generated data. The ease with which the users can build and edit the business rules to automate the workflow was a major requirement. 3. Analysis: There are four BI platform capabilities present in the analysis category. They are OLAP, predictive modeling, scorecards and visualization. To date, the enormous majority of the organizations focus on just the OLAP capability. But with the increasing interest in the process- and strategy-driven BI, the need for predictive modeling and scorecards will also increase. Predictive modeling is required to determine in before hand the outcome of different business events. This information when used rightly can promote better planning and optimize the business processes. The Scorecards can be used to bring association to the business by making performance metrics and the cause-and-effect relationships which will be visible to the entire organization. Finally, the visualization, which uses the best practices to display the data in an efficient manner can be increasingly adopted by the BI platform vendors to make the solutions easier to consume by a wider set of users. a. OLAP: This capability allows the end users to analyze the data with extremely fast query and calculation, performance, allowing a style of analysis known as "slice and dice." This capability can span a range of storage architectures for example, relational, multidimensional and in-memory. The analysts look for the capability of the users to easily define the functions and add or edit the dimension members. The BI platforms also checked the capability to execute sophisticated sorting or ranking, alternate hierarchies, inter-row calculations, asymmetric hierarchies and drilling down on measures. Performance attributes, such as the capability to perform Relational OLAP (ROLAP) calculations, where the in-memory aggregations and trickle feed cube loading are also examined. b. Visualization: This capability allows the different aspects of the data to be displayed more efficiently by using interactive pictures and charts instead of the rows and columns. BI platforms were assessed on the ability to project multidimensional data in a two-dimensional screen with the help of the size, shape and colour of objects to show dimensionality. The capability to project data onto any physical design surface such as a physical store, airplane or stadium can also be examined. Finally, the analysts look for BI platforms that give a wide range of chart types beyond the basic bar and pie charts, to include the chart types such as the heat maps and the geographic maps. Credit can be given to the BI platforms that allowed easy interactivity with the charts. o Real-time/batch scoring.d. Scorecards: This capability takes the metrics displayed in the dashboard a step further by applying them to the strategy map which aligns the key performance metrics with the success of the strategic objectives. However, the scorecard involves the use of a performance management methodology such as the "balanced scorecard" framework or the Six Sigma. The analysts assessed the BI platforms on the capability to design the strategy maps, support the common scorecard methods, apply the performance management methodologies, encourage the association about the performance metrics, and summaries, display, and group the performance metrics. Most of the vendors with a scorecard product were able to meet all the demands requested. Some of the vendors without a formally designated scorecard product were able to show some scorecard functionality with the reporting and dashboard products.